LG Electronics Inc. said Sunday that its latest high-end smartphone, the G6, has sold over 30,000 units in just two days since its debut here, heralding better-than-expected sales down the road. LG Electronics began selling the G6 in South Korea on Friday, as it seeks to revive its money-losing smartphone business. The G6, which features a 5.7-inch screen and dual 13 mega-pixel rear-facing cameras, was unveiled last month at an annual technology fair in Spain. 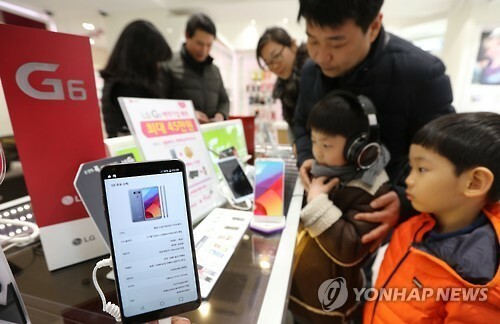 Its popularity has been widely expected as over 80,000 customers preordered the high-end smartphone during an eight-day period. The launch of the G6 came as Samsung Electronics Co., the world's largest manufacturer of smartphones, is still reeling from the global recall of the Galaxy Note 7 phablet, which was scraped last October over fire concerns. Attention is focused on whether LG can take advantage of Samsung's woes in the premium smartphone market. The G6, with an 18:9 screen aspect ratio, is the first smartphone that supports both Dolby Vision and HDR technologies, which offer a wider range of color and luminosity, wherein both the darkest and the brightest areas are more vivid, according to LG Electronics. The price of the G6 is set at 899,800 won ($775.80) in South Korea. LG is also set to begin selling the G6 in overseas markets sometime soon. With its flagship smartphones failing to appeal to consumers amid tougher competition from Chinese brands, LG's smartphone division has posted operating losses since the third quarter of 2015. During the fourth quarter of last year, LG's smartphone business division reported an operating loss of 467 billion won ($402.7 million) on sales of 2.9 trillion won.